Topics: Personalities, Stace, Duke Rice, Shannon Solo, Shows, and Funeral Notices. 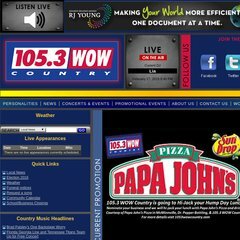 1053wowcountry.com 105.3 WOW COUNTRY - Today&apos;s Country & the Legends! Its 2 nameservers are ns1.dns-diy.net, and ns2.dns-diy.net. The programming language environment is PHP/5.1.6. National Fulfillment Inc (Tennessee, Lebanon) is the location of the Apache/2 server.